It’s cold and it’s grey outside, but at the moment I feel more motivated than I have in a while. I’m finding it hard to put my finger on what went wrong with this year. It’s not been a bad year, many good things have happened. I’ve just felt an overall feeling of stress and a lack of motivation. I think it started with being diagnosed with High Blood Pressure, which after many stressful investigations resulted in me being diagnosed with Fibromuscular Dysplasia. It’s not like I was tearing my hair out over it. Generally I take these things in my stride, it just threw me off balance a little, and I felt like I never really got back on track. But recently I’ve started to feel a little more on it. Which is a good thing, and I’m guarding that feeling like it’s made of gold. I have my Personal Trainer Level 3 assessment booked in for early in the New Year, and I’m knuckling down for the last slog to finish off my studies. But in the meantime, I’ve also done a little wardrobe updating, and I don’t mean to be shallow, but I think it’s helped a bit. 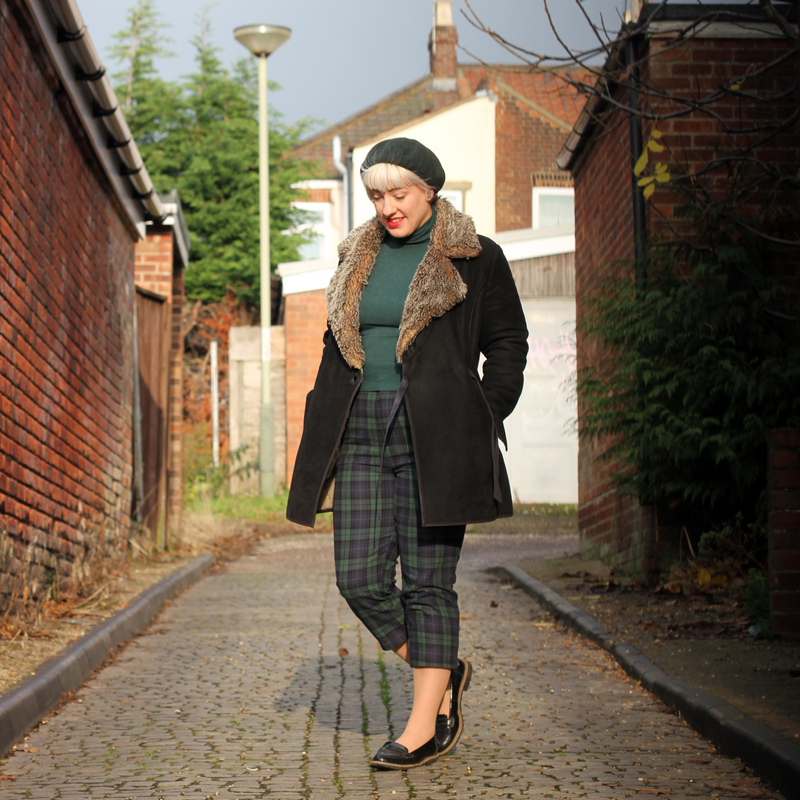 These are the tartan trousers I bought back in October. I hacked about 12 inches off the bottom, and still need to take them up properly, but they’re a dream match for a very old green roll neck and my green beret. 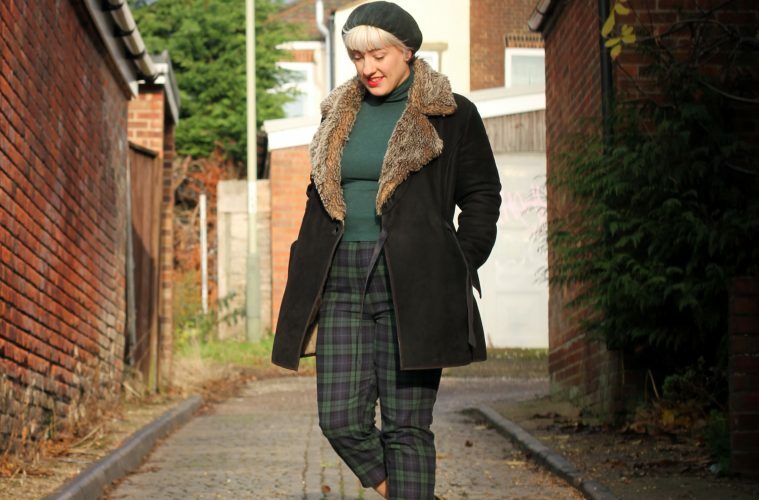 Part of my year-long malaise has resulted in my doing very few outfit posts this year, meaning the “Year in Outfits” post I traditionally start the new year with is going to be a struggle. The reason for those very few outfit posts is that I’ve dragged myself through 2018 in a selection of gym kit and dog walking clothes. I’ve been to the pub in dog walking clothes, and stopped for coffee in town in gym kit, and putting an effort into what I wear seemed like a faff. Now I’ve written down that little spark of motivation, I’m already suffering the anxiety that it will be snuffed out. Then I went back and re-read this post that I wrote in 2016 about being a Chronic Worrier, and I realised I didn’t sleep well last night, so an early night and a Nytol will no doubt send that anxiety packing! The idea of self-care has taken a bit of a bashing recently. Self-care kind of got co-opted by the bubble baths and glitter brigade, and the fact that sometimes it can just mean brushing your hair and making sure you ate today got a little lost. But in taking back the term, some people can get a little sniffy about more frivolous actions being termed self-care. How I look and dress has always been important to me, when I feel good I like to dress up, I like to do my make-up and I like to take time and pay attention to my appearance. When I feel bad I can’t be bothered, it seems pointless and I just want to be comfortable. But there’s a cause and effect in action too. I’ve felt like I haven’t had the time to make an effort, that whenever I’ve gone out somewhere nice I’ve been too busy to pick something nice to wear, or do my hair and make-up, and correspondingly that’s made me feel bad. Taking back the time, prioritising myself and trying to make the effort to put on lipstick, even if I’m just going to the corner shop, has a correspondingly positive effect on my mental health. It might be shallow, but it works for me just as much as exercise, mindfulness and making sure I eat well. So they might just be a pair of trousers (or the disturbingly large order I may or may not have put on my credit card when Joanie Clothing had a sale), but to me they’re a lot more. 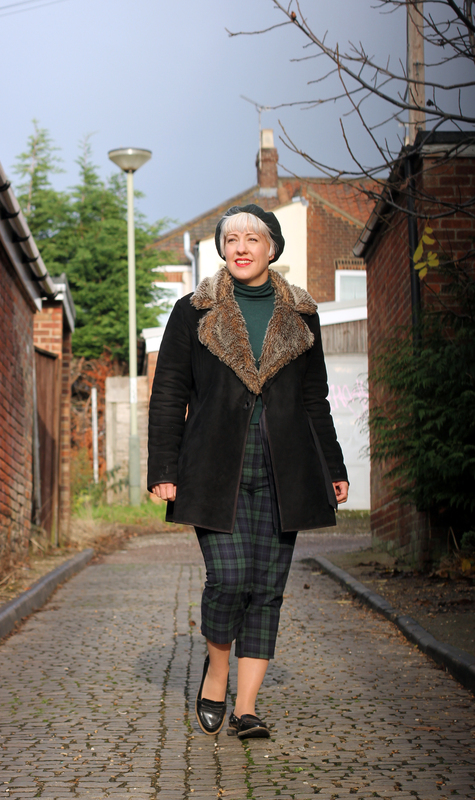 Taking care of yourself means something different to everybody, and it’s different at different times in your life, but to me, at the moment, it means a new pair of trousers and a vintage brooch to pop to the shops for a coffee. These trousers are fabulous! I want some! They’re sold out, sadly! I linked to some Warehouse ones that are similar. I tried those ones but they were too tight on my thighs, so I think it depends on your build! Love your outfit. And totally understand how you’re feeling. I’ve had a really busy November and neglected my own self care routines like yoga and eating well, so December is a bit calmer, had yin yoga tonight and seeing nobody after Christmas is done. Sounds lovely! It’s amazing how those little things make such a difference!